In press, in Crystal Growth and Design. A short paper with an important message. In principle, solid-state quantum chemical methods provide the tools for both the prediction of crystal polymorphs and the calculation of the relative energies of characterized crystal forms to determine why one version forms preferentially. That said, modern solid-state quantum chemical methods are dominated by density functional theory which, although work is being performed to address this issue, are fundamentally incapable of accounting for all of the energy terms in the complete lattice energy calculation of solid-state materials because dispersion forces are not accounted for (there are methods around this, be they empirical or by way of solid-state Moeller-Plesset Perturbation Theory, which we may even have the computing power to handle someday…). In molecular polymorphs, the energies of the crystal cells per molecule may be quite similar to one another because, being molecules with polar and non-polar regions, specific functional groups tend to bind preferentially to other specific functional groups, which all may involve similar interaction energies. The point is that the lattice energy differences between different polymorphs may be quite small. In such cases, the vibrational zero-point energy of the crystal cells may be very important contributors to the experimentally determined polymorph energy differences. Such is found to be the case for the alpha- and gamma- polymorphs of glycine. 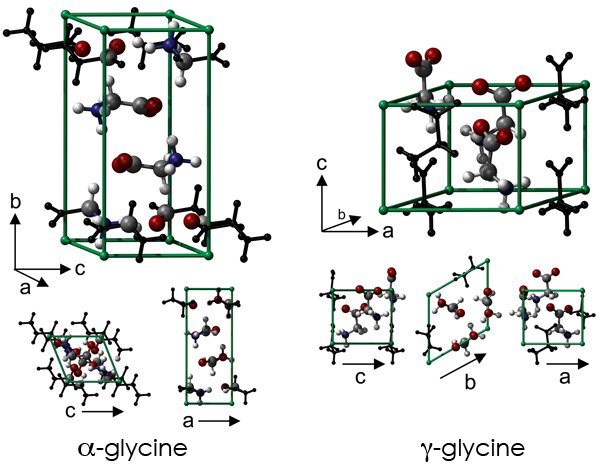 Specifically in the glycine example and other polymorphs for which proper thermochemistry is available, we even have a means to estimating what SHOULD be the lattice energy of the crystal without relying on theoretical models (and their inherent limitations). For glycine, the experimental enthalpies for both crystal forms have been measured. We have the experimental vibrational spectrum available against which to compare the theoretical work, from which we can determine the zero-point energy for the unit cell (simply 1/2 the sum of the vibrational mode energies). With that information, we can determine (to a first approximation, there are many other factors to consider that play lesser roles in the final value) the experimental lattice energies. These values then provide a benchmark for determining the abilities of theoretical models to reproduce this most fundamental of the solid-state quantum chemical properties. Abstract: The relative stability of polymorphic crystal forms is a challenging conceptual problem of considerable technical interest. Current estimates of relative polymorph energies concentrate on lattice energy. In this work the contribution of differences in zero-point energy and vibrational enthalpy to the enthalpy difference for polymorphs is investigated. The specific case investigated is that of alpha- and gamma-glycine, for which the experimental enthalpy difference is known. Periodic lattice DFT computations are used to provide the vibrational spectrum at the Gamma-point. It is confirmed that these methods provide reasonable descriptions of the inelastic neutron scattering spectra of these two crystals. It is found that the difference in the zero-point energy is about 1.9 kJ/mol and that the vibrational thermal population difference is 0.9 kJ/mol in the opposite sense. The overall vibrational contributions to the enthalpy difference are much larger than the observed value of ca. 0.3 kJ/mol. The vibrational contribution must be largely compensated by the lattice energy difference. The polymorphs of glycine differ in the pattern of their hydrogen bonds, a feature common to many polymorphs of interest. The consequent difference in the N-H stretching frequencies is a contributor to the zero-point correction but the major effect stems from changes in the bending vibrations.